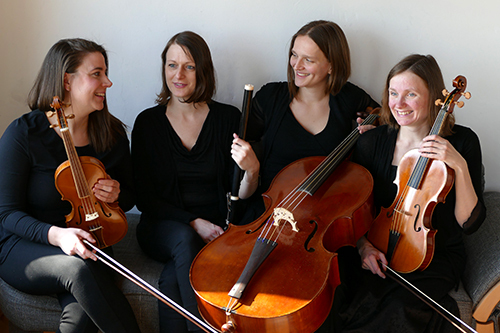 After successful education on modern instruments the four musicians of the Ensemble Musica Clara discovered the world of historical performance practice. They were trained in the most reknown masterclasses and tutored by prestigious representatives of the scene (Barthold Kuijken, Frank Theuns, Jaap ter Linden, Kristin von der Goltz, Midori Seiler, Michi Gaigg). Now they play in many well-known formations both at home and abroad (L’Orfeo Barockorchester, Göttinger Barockorchester, Concentus Musicus Wien, Main-Barockorchester Frankfurt, Barucco Consort, Wiener Akademie). Sieglinde Größinger (Travers flute), Judith Schreyer (Baroque violin), Erika Emans (Baroque viola) and Angelika Miklin (Baroque cello) are specialized in the music of the baroque and classical period and together they are working in this area with great interest and infectious enthusiasm in search of lively and authentic interpretations.